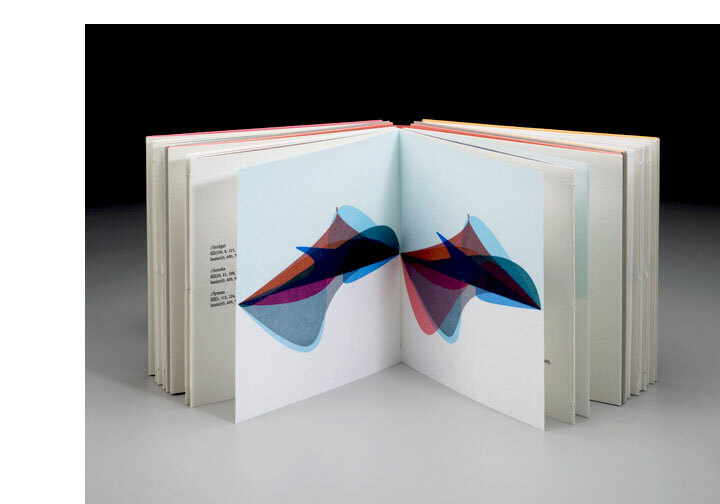 Bridget Elmer: "Bookmaking, for me, is a public act of communication. My work explores reading as a generative, creative act, and engages the book's potential as a persistent information technology." Tallahassee, Florida: Flatbed Splendor, 2010. Edition of 50. 5.75" x 5.75" x 1.5"; 60 pages. Handmade paper. Letterpress printed from photopolymer plates. Variation on accordion fold by Hedi Kyle. Housed in an archival folding box with velcro closure. Flatbed Splendor Press: "Fibre Libre is an artist's book that tells the story of a group of people, learning about free software while learning to make paper. It is the first manifestation of the Open Edition Project." "Fibre Libre began as an event, which took place at Asheville Book Works in the summer of 2009. At the event, a variable edition of paper was handmade by a community of participants. The paper was made from natural fibers, pulped from the clothing of community members. "After the event, the fiber content of the paper was quantified and imported into a computer program written in Processing, an open source programming language. Using several simple commands, the program draws a series of Bezier curves, based on the fiber content of each sheet of handmade paper. Each curve represents one of the Fibre Libre participants. "The resulting images and their code were then made into photopolymer printing plates. The files for the plates were digitally prepared using Processing and Scribus, an open source desktop publishing program, and output as Press Quality PDFs. The PDFs were made into high density negatives by a local service bureau, which were then used to produce photopolymer plates. "The plates were printed on a Vandercook Universal letterpress at Florida State University’s Small Craft Advisory Press. The prints and handmade paper were then bound by hand into an artist’s book, in an edition of 50 handmade copies." "The story is told in two ways, with the paper forming one narrative and a series of images forming the second. Just like the papermaking event, this book serves as an invitation to learn. Behind the paper sheets (object) are printed instructions (source) for how it was made. Behind the images (object) are printed the codes (source) from which they were generated. In this way, Fibre Libre serves as an exploration of free software and how its architecture can be enacted and understood through the book form." Bridget Elmer, artist statement: "Fibre Libre is the first manifestation of the Open Edition project. Open Edition was founded to explore the philosophy of FLOSS (Free/Libre/Open Source Software) through the medium of the artist's book. Through this exploration, the artist's book is considered both for its potential as a free information technology and as a free cultural work. From this original intention, many derivative works have grown. First, an event, Fibre Libre: Open Source Papermaking, which took place at Asheville BookWorks in the summer of 2009. At the event, a variable edition of paper was handmade by a community of participants. Then the fiber content of the paper was quantified and imported as numerical data into a computer program written by Flatbed Splendor in Processing, an open source programming language. Using several simple commands, the program draws a series of Bezier curves, based on the fiber content of each sheet of handmade paper. Before finalizing the program, the code was sent to all Fibre Libre participants, who were invited to generate Bezier curves as representations of themselves. The resulting images and their code were then made into photopolymer printing plates. The files for the plates were digitally prepared using Processing and Scribus, an open source desktop publishing program. The plates were printed on a Vandercook Universal I letterpress at Florida State University's Small Craft Advisory Press. The prints and handmade paper were then bound by hand into an artist's book. The book is a hybrid form, combining three volumes of Hedi Kyle's non-adhesive accordion structure with the pamphlet stitch. 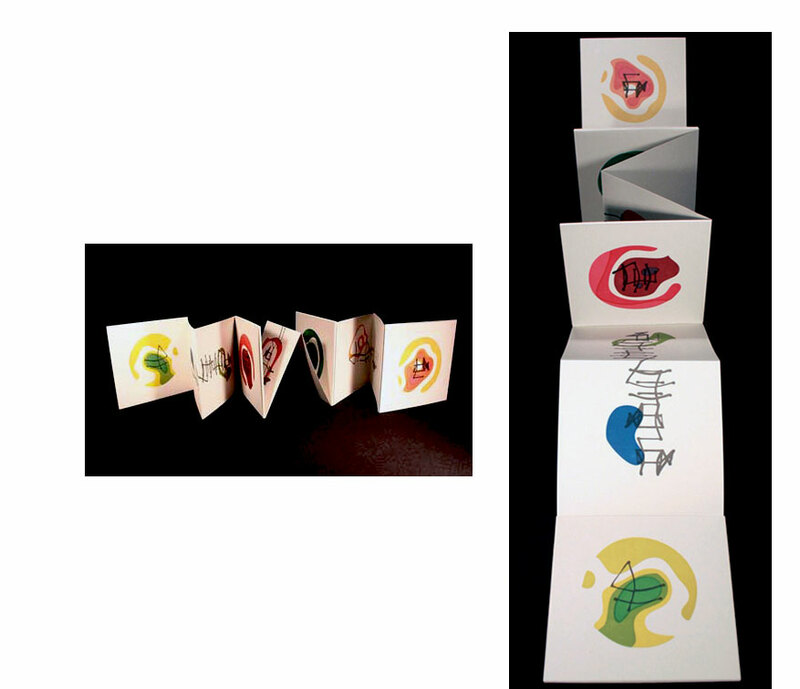 The three volumes are attached by removable spines and include a total of 60 letterpress printed pages, 16 colors of ink, and 13 versions of collaboratively handmade paper." Bridget Elmer, e-mail: "This book is a response to what I think is a very significant gap in current scholarship and pedagogy with regard to artists' books. I got into this field because I was inspired by the ability to self-publish, forgoing proprietary models and circumventing the huge publishing houses. In addition, I was thrilled by the direct interaction between the reader and the artist. As book artists, we pride ourselves on our intimate knowledge of the architecture of the book (an information technology). We are empowered by the ability to make a book from start to finish, completely by hand. And yet, with the advent of photopolymer plates, we shifted our practice into the digital... without necessarily exploring the architecture of the information technology we employ. "To sum up, we'll fight for days on the listservs as to whether or not polymer type prints as well as lead type. We'll argue down to the millimeter when it comes to our binding decisions. But we'll just fire up the Adobe Creative Suite, live trace our drawings and make a negative without ever understanding the code (written by someone else!) that generates our content. This seems like a disconnect to me." "The content for the book began at the papermaking workshop. This was when I was first beginning to explore open source and free software as a model. I planned the workshop to be a sort of exploration of these ideas. I invited a bunch of friends (from those who had experience with papermaking to those who had never tried it) to join me to try to work out these ideas. Before they came, they send me their clothing, which I beat and turned into several vats of pulp before they arrived. I grouped their clothes based on color and kept detailed notes as to 'who' was in each batch of pulp. When they arrived I gave a papermaking demo and also showed them how I beat the fibers into pulp. Then, we began the Open Source Papermaking, again keeping close track of 'who' was being added to the vat. Each person who came up the vat got to choose which color they added to the vat. Then we started a second vat. Then a third! (Hence the three volumes of the book). What resulted were three variable editions of paper, the progression of which you see in the book. "So that's where it began. Then I discovered the Processing program and wanted to share that as a part of the project. Processing is designed to teach people how to think in code when creating images, so its goals are similar to the book's. "In the end, this book about accessibility sure needs a lot of decoding to be accessible. I feel, however, that this is justified. Because if you start to get into open source software, it's like learning a new language. In this way, encountering the book creates an experience that is metaphorically very similar to encountering the object and source code of an open source program. Initially it seems simple but elusive and foreign. As you dig deeper, the complication builds as the architecture of the information is revealed." Tallahassee, Florida: Flatbed Splendor, 2009. Edition of 43. 6.25 x 6.25 x 1.5"; 20 leaves. Letterpress printed from photopolymer plates. Digital collages by the artist. Handset type. Variation on accordion fold by Hedi Kyle. Housed in an archival folding box with velcro closure. Each end of the book has removable spines to allow manipulating of the pages in many ways. The pages come apart. It is up to readers to make the sequencing what they wish. Text: "Paradigm shift. Every choice becomes a new connection to be made. We are not static. We are not stuck. Predetermination becomes plasticity.Synapses become symbols with constant potential for new meaning. This book is dedicated to the artist's father, whose beautiful brain fills these pages." Prospectus: "WE CAN GO BEYOND IT explores the theory of neuroplasticity - an assertion that the human brain is capable of changing itself. Inspired by the source imagery, generated from EEGs of her father's brain, the artist simulates the neurological process of synaptic change. The original brain maps are dismantled and transformed. 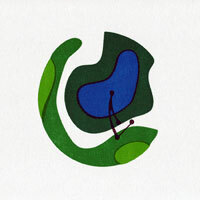 The resulting symbols and color fields are recombined into new images, new openings. The reader is invited to take the book apart, rearrange it, go beyond it. A celebration of possibility and free will, We Can Go Beyond It represents our inherent ability to change and renew." Flatbed Splendor: "Source imagery generated for therapeutic use and graciously donated by Dr. Thomas Matthews at Optimum Performance Solutions in Topeka, KS. Letterpress printed in 16 colors and 62 runs at the University of Alabama. 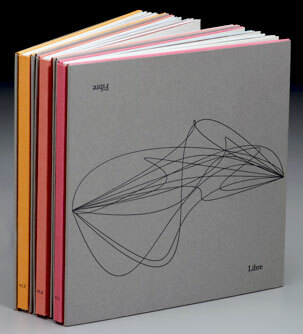 Handbound in a limited edition of 43 copies."